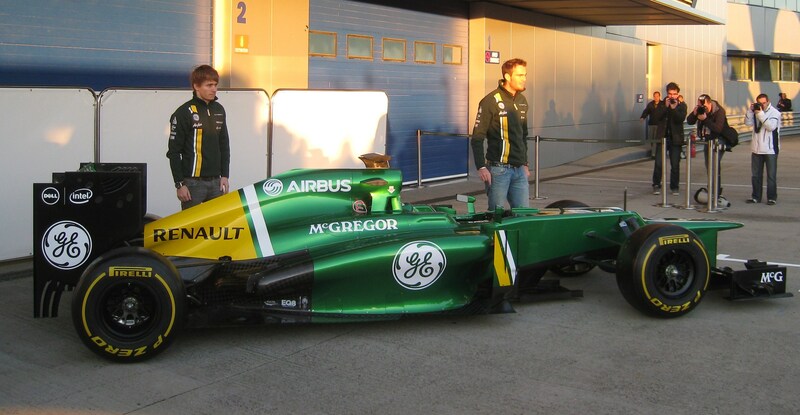 Caterham left it to the last minute by launching its new CT03 just before the start of testing at Jerez today. The car features a dramatic new livery and retains the step on its nose. Significantly it’s the first car produced in the team’s new facility rather than at its original home in Hingham. The car is called CT03 because CT02 was allocated to a road car. “CT03 is the first car we have produced in the Leafield Technical Centre so it marks an important milestone in the development of our team,” said technical director Mark Smith. “The season ahead presented us with an interesting challenge early in the design process as it is the last year of the current regulations before the introduction of the new engine rules in 2014. Smith insists that the car has changed a lot since last year. “We have made a number of significant changes to the car that takes it from the package that gained us tenth place in the 2012 Championship in Brazil into CT03. Among the most obvious are around the lower chassis where the sidepods have been significantly undercut to improve airflow to the rear of the car. “The diffuser, engine cover and cooling exits have also seen major changes and there are more subtle improvements to other areas of the car, such as the sidepod turning vanes and the lower tea-tray area. This is the package we will take to race one in Australia, and as part of the 2013 upgrade programme we will then bring new front and rear wings and a new diffuser soon after the start of the season. “However, the CT03 car that starts testing in Spain on day one in Jerez is not the only visible change amongst a number of other important developments at Caterham this winter. Adam, so you think we will see a bigger gap between the top and lower teams this year with resources being put into the 2014 regulations by those more financially restrained?